Columbia High School’s Unified Basketball team has been selected to compete in the 2018 Special Olympics USA National Games to be held in Seattle, Washington in July. The team is composed of athletes with and without intellectual disabilities and will compete against unified teams from across the country. The members of the team are current students and alumni of Columbia High School who all have participated on its Unified Basketball team. Unified Sports is a partnership between Special Olympics New York and the New York State Public High School Athletic Association (NYSPHSAA) to provide interscholastic sports for students with and without intellectual disabilities. 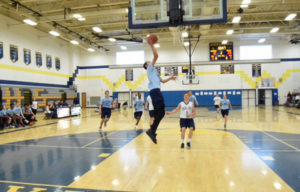 The program piloted in 2012 in Section 2 of NYSPHSAA with 12 schools. There are currently 129 schools participating across the state. 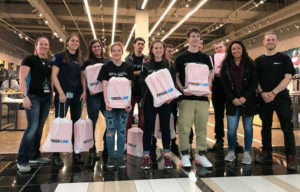 On November 16, Columbia’s Unified Basketball team was outfitted with free team sneakers at the Finish Line in Crossgates Mall as part of the company’s annual holiday campaign. The 2018 Special Olympics USA Games will be held in Seattle, Washington July 1-6, 2018. More than 4,000 participants representing all 50 states and the District of Columbia, along with the support of tens of thousands of volunteers and spectators, will compete in 14 Olympic-type team and individual sports. The 2018 Special Olympics USA Games will celebrate the Special Olympics movement and its 50th anniversary; promote the ideals of acceptance and inclusion through sport; and showcase athletes from throughout the U.S. and the abilities of people with intellectual disabilities. The 2018 USA Games will also highlight Special Olympics’ work in sport, education, health and community-building. Special Olympics New York will be sending 52 athletes who will represent the state in volleyball, bocce, golf, gymnastics, powerlifting, soccer, tennis, bowling, athletics, aquatics and unified basketball.